Focus System: Coaxial Coarse and Fine Focusing knobs on both sides. 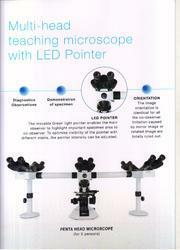 Glass Agencies EROSE are Manufacturer of Penta Head Microscope. Usage/Application: Used in medical and sanitary established laboratory, institutes, colleges and universities. 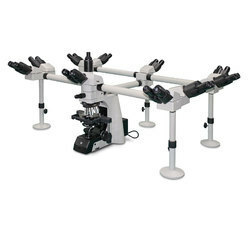 Multi- viewing Microscope is equipped with 5 heads for 5 Persons observing at the same time. With hard-earned experience of our adept professionals, we manufacture a precisely manufactured Penta Head Microscope. - Widely used in clinic, scientific research and teaching demonstration. a) Compensation Free trinocular Head, lnclined at 30° , 360° Ratatable, lnterpupilary Distance 48-75mm — 1 pc. b) Compensation Free binocular Head, lnclined at 30° , 360° Ratatable, lnterpupilary Distance 48-75mm — 4 pcs. Glass agencies are manufacturer of pentahead multi viewing microscope. Specification: PENTA Microscope. Equipped with 5 Heads for 5 persons observing at the Same Time with the features of Infinite Optical System, Effective illumination, LED Pointer and images Coherence, it is widely used in Clinic, Research and Teaching Demonstration. "Light is matter of balance between atmosphere and functionality" is how Penta look at lights. Their lamps are a fusion of architectonical essentials and timeless elegance. Their products feature the best merger of materials with different characteristics like blown glass, wood, metal, and fabrics. We are offering Penta Head Microscope to our client. Roslane Meditech are eminent Indian Exporters of Scientific Instruments and Laboratory Microscopes etc.